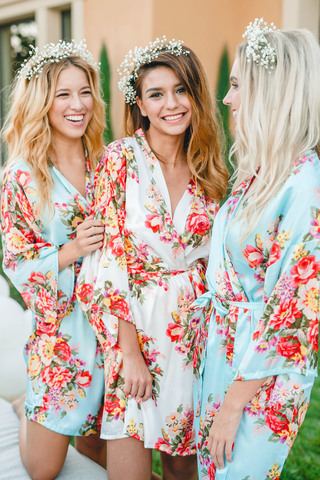 This fluttery cross-over bridesmaid floral robe is fun, flirty and so romantic. The colorful blossoms add a feminine splash to a drapery silky satin kimono, they make every wedding photos so effortlessly and adorable. Trust me, your wedding party will look amazing with these getting ready robes! Made from luxury satin fabric, with a soft and silky hand feel and vibrant floral print.